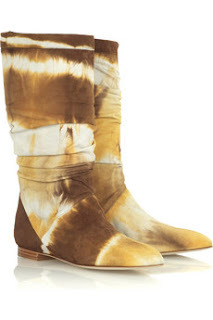 Proof that fugly isn't confined to the high street are these Brian Atwood boots in pukeariffic brown tie dye. The shape of the boot itself is perfectly fine - very elegant and light. It's just the fabric renders all that insignificant in the shadow of its fug. And the price? £565. Umhm. No.